Full 3G/2G, Bluetooth and Wi-Fi connectivity, 2-inch curved Super AMOLED with a QWERTY keyboard feature. Samsung made it easy for users to enjoy the many features Gear S offers, but according to some of the product managers and engineers, bringing the Gear S to the market wasn’t so easy. Here is why. One of the priorities for the Gear S was to give users freedom to both hands, which means it was necessary for the Gear S to have standalone features. Therefore, the connectivity features of the Gear S such as Wi-Fi, Bluetooth and 3G connectivity, were extremely important. This was the first time a wearable device offered such connectivity. And as the Gear S is significantly smaller than smartphones, Samsung engineers had to get creative to fit the necessary components and modules into the device. For example, to implement notification features on wearables, Samsung had to use its own relay server. This relay server would facilitate forwarding of notifications from smartphones to the Gear S. Thanks to this new technology, users can stay informed with seamless notifications from social networks even when they are away from their smartphones. Thus, as the first standalone smart wearable device, the Gear S has expanded the smartphone experience to the wrist, delivering an up-to-date smart wearable experience with 3G connectivity and wearable optimized technology. The Gear S has more clear unique characteristics than just its connectivity features; i.e., the curved Super AMOLED display. 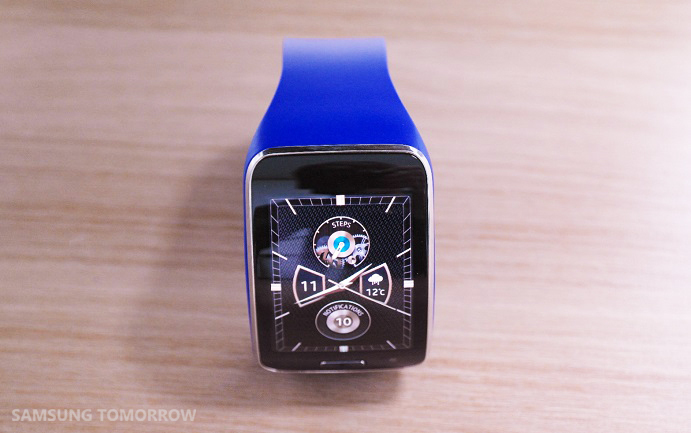 As smooth as it looks, the process of applying the concept to the Gear S posed multiple challenges. 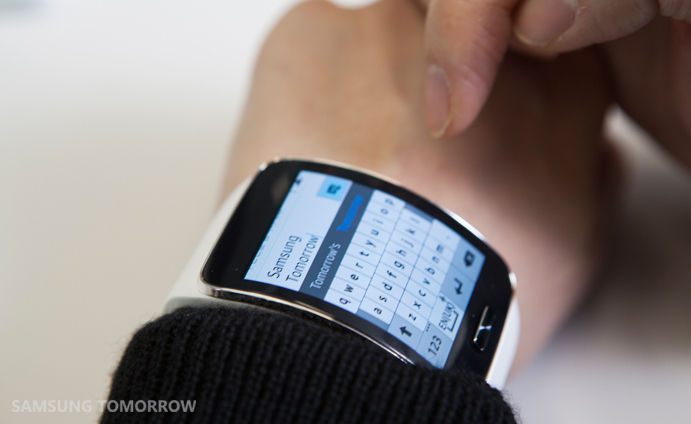 This was not the first time a curved display was attached to a wearable device, as the Gear Fit was Samsung’s first wearable device with a curved display. However, Gear S’s smartphone like experience made it harder for the engineers to find the right screen size, finding the right balance between usability and wearability, maximizing user experience. For instance, it was hard to control the visibility considering the difference in the curve and reflection of the Gear S.
It’s not just the screen – the antenna and battery needed to follow the curve as well. 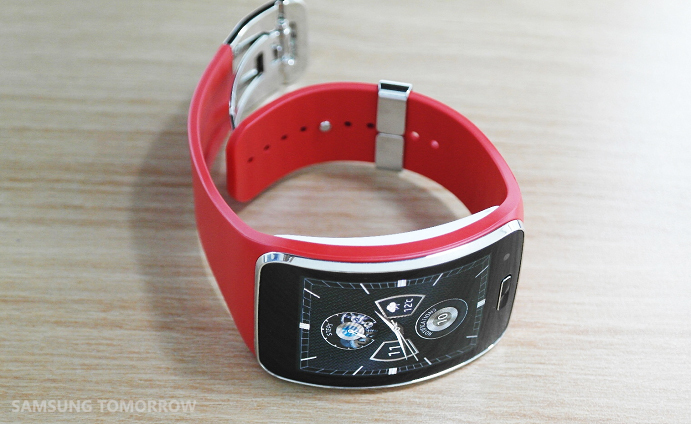 For the Gear S, the antenna was made part of the curve, on the outside frame. This, of course, required a whole new antenna design and engineering skills. For the battery, Samsung already had experience, having curved a battery for Gear fit. Curved screen, curved antenna, curved battery. To provide a stunningly rich and detailed viewing experience through the Gear S, the features had to be optimized for the curved screen. It wasn’t an easy task for the UX designers, because the optimal point at which information could be absorbed for the curved screen was different from a flat screen. For instance, a circle on a flat screen looked like an oval on a curved display. So the designers and engineers had to go through countless mockups and engineering tests to fix the problem. For the Gear S to have a comfortable fit, researchers at Samsung collected 3D wrist data on wrist width, thickness, circumference, etc. from around the world, regardless of age or ethnicity. After they gathered all the information, they calculated the best ratio and size of the Gear S. Then, they researched and discussed about the data day and night. After in-depth evaluation and simulations, they finally realized that the 2 inch was going to be the most optimized dimension for the Gear S.
Another examination that determined the size of the display was the input of the QWERTY keyboard. According to the Senior Designer Dohyoung Kim, UX Design Group at Samsung Electronics, if the screen were to be smaller than 2 inches, then the users would not be able to type comfortably, because of the narrow keyboard. Hence, they found that the QWERTY keyboard happened to fit perfectly on a 2-inch screen. 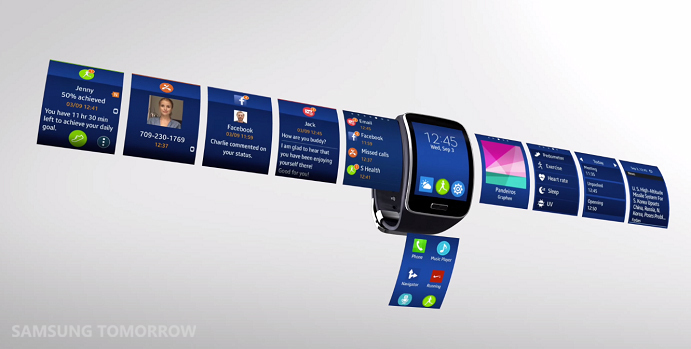 Thanks to the 2-inch display, users can do a complete range of tasks from their wrist while on the go. The clock face (home screen) of the Gear S alone can pack various types of information such as the date, pedometer, the number of unchecked notifications, battery life, and more. The 2-inch display also makes it easy for people to check all these details at a glance. As you can see, it definitely was not easy for the people at Samsung to create the industry’s first standalone smart wearable device, but thanks to the effort they made, we now have the option to do more with our wearables and take the mobile experience to another level. *All functionality features, specifications, and other product information provided in this document including, but not limited to, the benefits, design, pricing, components, performance, availability, and capabilities of the product are subject to change without notice or obligation.